Home area rug cleaning What Makes Signed Persian Rugs So Special? What Makes Signed Persian Rugs So Special? As many collectors and lovers of “Oriental” rugs know, the mark of a unique handmade rug is the signature. This distinctive symbol of the weaver can be of the workshop where it was made, the weaver who wove the rug, year made, the region of origin, and in rare cases, all the above. There is no mistaking the superior quality of these rugs. These works of art exhibit flawless craftsmanship, superb materials, unique and outstanding design, and incredible color combinations. The signed Persian rugs come mostly from the weaving regions of Nain, Tabriz, Qum, and Isfahan. 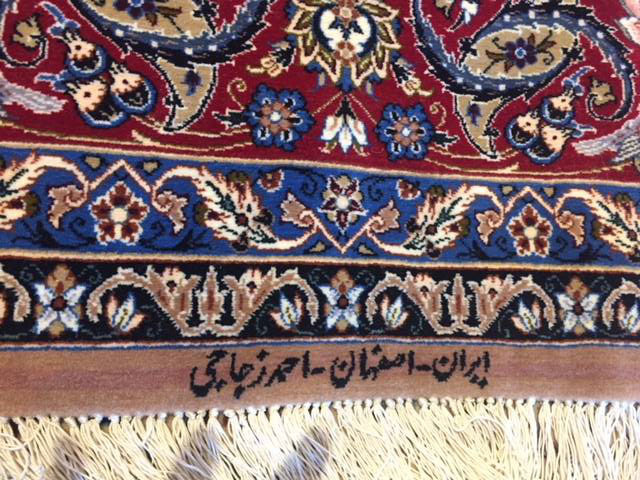 Top and center of the rug, either in the minor/major or main borders are where you will find these signatures and “Isfahani rugs are nearly all signed because of the competition in the area. Historically, hand-knotted rugs have been made by country people who were essentially illiterate. Farmers, weavers, and shepherds might be able to recognize and write a few numbers and letters. In the past rug cultures, there was not a possibility of learning to read and write fluently. Literacy is still a major problem in most weaving countries. It can be quite the challenge to interpret a date woven in a rug as that is the usual means of marking a village or tribal rug. The task of spelling is not as easy as counting and so by nature village or country weaving is anonymous. Weavers are very proud that they make designs learned from their parents and relatives. The thought of respecting the collective as opposed to making a big impression is the village design norm. The village is a tightly knit and protective community so if you create an unusual design or sign it flamboyantly it could start the gossip behind your back. These factors contribute to the reasons why primarily the city rugs are signed. We term the city rugs as those woven in a more densely populated metropolitan area where someone can write the initials even if the weaver is illiterate. Hardly ever is the signature the actual mark of the weaver: most commonly it’s the trademark of the entrepreneur who paid for the rug to be woven. Nearly all signatures are in Farsi (Persian) written in Arabic script and most often it’s the patriarchal name of a weaving family. When evaluating your rugs whether it’s to purchase or to clean, pay close attention to the sometimes-hidden signs that it is something extra special. Oriental Rug Salon is a Certified Partner with the prestigious Institute of Inspection, Cleaning and Restoration Certification (IICRC) and the International Carpet & Rug Institute (CRI). In addition, we are A+ rated with the Better Business Bureau and a four-year-in-a-row-winner of the coveted Angie’s List Super Service Award. If you’re ever in need of a quality, hands-on, Oriental, wool or silk area rug cleaning or repair, we hope you’ll consider Oriental Rug Salon. For more information on our company, please visit us online at www.OrientalRugSalon.com or call us anytime at 239-424-8171 (Lee and Collier County or 941-893-1655 for Sarasota, Port Charlotte, and Charlotte County FL.